Taking a cruise is an exciting way to vacation, and it can be so much more than any typical land-based getaway – if you know how to take advantage of all that a cruise offers. No matter what cruise line, ship or itinerary you choose, new cruisers should do these five things to really make the most of their voyage and learn what cruises are all about. As soon as a new cruiser gets on the ship, they should make an effort to get to know their way around. Not only will learning the ship’s layout ensure you don’t miss anything because you can’t find the right meeting spot, but exploring the ship will reveal fun nooks and crannies such as unique decorations, ship awards and quick shortcuts from one hotspot to another. There may be a quick tour of the ship available on embarkation day, or new cruisers can get maps or basic deck plans from the information desk. Related: How To Find Your Way Around A Cruise Ship – Fast! Just walking around the ship and trying new corridors will reveal plenty of great things to discover, such as the peaceful respite of a ship’s chapel, the excitement of the arcade, the calm elegance of the library and the luxury relaxation of the spa. Make a toast to new experiences and a great vacation with a new drink, whether it is trying a new type of craft beer, a signature ship’s cocktail, a rich glass of wine with dinner or an exotic after dinner aperitif. With no worries about driving on a cruise, it’s safe to indulge just a bit, or if you prefer zero-proof drinks instead, you can opt for many different mixed drinks, smoothies, luxury coffees and other tasty drinks without alcohol. Cruise ships are staffed with expert bartenders and mixologists who will be happy to help you choose an appropriate drink even if you aren’t sure what to order. Food is a central part of any cruise ship, with gourmet restaurants, casual buffets, customized delis, burger joints, room service, snacks and more all on the menu. Instead of staying in your comfort zone and only ordering familiar foods, a cruise is a great opportunity to expand your palette with new tastes. Try conch fritters, tropical chutneys, chilled fruit soups, delicate escargot, seared quail, spicy gazpacho or any number of decadent desserts – the menus change daily. If you don’t like what you taste, the dining staff will be happy to provide you with a different dish without any trouble. It’s important to get involved on a cruise, and too many new cruisers only stick with familiar activities. Check out the daily schedule and you’ll find trivia contests, craft projects, shopping sales, comedy shows, bingo games and photo opportunities, all safe, common activities. But you’ll also find more fun games and things like scavenger hunts, art auctions, informational lectures, revue shows and many unique options that you may not have a clue what they’re about. The only way to learn, and to discover fun new activities, is to try them out. You’ll meet new people and make great memories of your cruise at the same time. While a cruise may be all about the amazing features on the ship, new cruisers shouldn’t forget all the wonderful places that ship will visit. Exploring different ports of call through organized shore tours is an easy, convenient way to get safely past the pier and experience new cultures and new adventures. Get all your cruise accessories for ashore right here. Never snorkeled before? Try it with stingrays or dolphins. Always wondered about Segways? Try one out on a tour of a new city. Enjoy a good glass of wine? Learn more when you visit a vineyard and join a grape stomp. Want to see whales? Opt for a whale-watching tour. Looking for a better view? Try parasailing or a zip line tour. There are always new things to try on cruise shore tours, or you can simply stroll off the ship and explore the port on your own, taking in new shopping, dining and other options at your leisure. New Cruisers Will Keep Cruising! 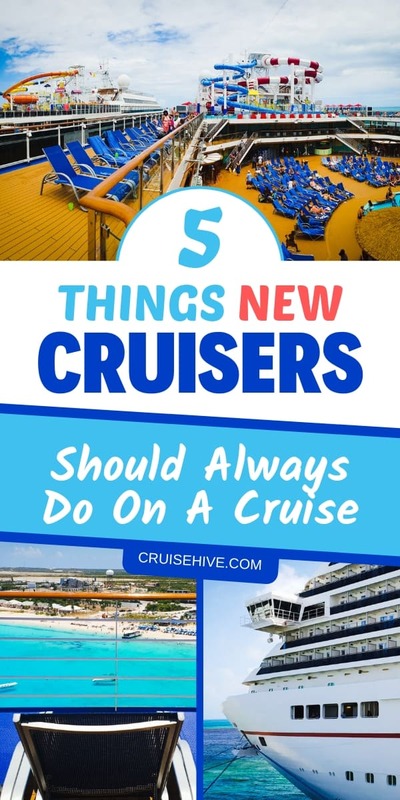 A cruise can be a phenomenal vacation, and new cruisers who try different things will discover more than just new experiences – they’ll discover their desire to be repeat cruisers along the way!